My last batch of Berliner Weisse was overly tart and needed some age to clean up an off putting aroma caused by whatever I cultured from the 2-row husks, some Brett dregs did eventually clean that up however. In an attempt to dial in my process for this style I made 2 minor changes for this batch. The first of which was adding a single decoction to the mash schedule. My goal here is to add a bit of body and malt sweetness to balance the sourness of the beer while hopefully getting a bit of graininess as well for complexity. The second change is the method for which I am souring the beer, harvesting the lacto from grain is just too unpredictable for what I am going for here. This time I am going to go with a commercial pitch of Lacto from White Labs, WLP667. I followed the same fermentation schedule as previous batches where I will pitch Lacto only to warm wort, 110f, and let it go for 48-72 hours then taste to see if I achieved a sufficient level of sourness. This was my first decoction so I kind of learned along the way, the measuring pitcher I used wasn't the best tool for pulling mostly thick mash so more wort than I wanted was pulled. 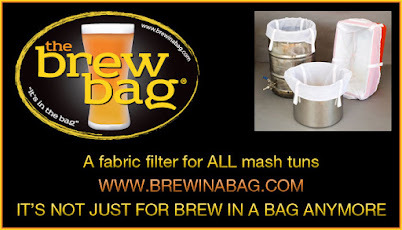 I will make sure to have one of these around next time around, as seen on Brewing TV's Decoction Day episode. After a Protein Rest of 132.5f, I pulled 15 quarts of the thickest mash I could and boiled it, stirring often for about 10 minutes. As you can see, the decoction was a bit too thin. After I added the decoction back to the mash and stirred I took a measurement and I missed the Saccharification, target was 154f and it was reading 149f. It probably would have been fine to let it ride as is but I wanted the saccharification rest to be a little bit warmer in hopes of adding a little bit of body to what can be a thin beer. So I pulled 1.5 quarts of wort from the mash, boiled it briefly, then added it back to the main mash and I hit 154f on the head. A wort only decoction step if you will. The decoction smelled amazing, and the color it produced was really nice once it was added back to the mash. A much deeper yellow as opposed to the white-ish yellow I was noticing prior. I pitched the lacto 6 hours after racking to the fermenter once it naturally cooled to 110f, then kept the fermenter on a heating pad for 72 hours. I tasted the wort and it was decently sour, there was no noticeable activity in the fermenter. I removed the heating pad and gave it another 24 hours to cool down to 68f I then pitched Conan ale yeast since I happened to have fresh slurry around. 10 days of primary fermentation and then I racked the beer to the keg to bulk age at room temperature for ~3 months. The color was amazing, a bright almost neon yellow going into the keg. I feel confident in my process for this brew session, and my hopes are high for this beer. Tasting notes to follow, I plan to enter it into a local (although quite large at 500 entries) competition, I will post the judges reactions in my tasting notes post down the road. Notes: Pulled 1.5 quarts wort only decoction, boiled to reach 154f after being 5 degrees short after decoction. Where does the name Supermoose of Norway come from? Ah, I was afraid someone might ask that. Unfortunately, it means nothing, to me at least. A friend once sent me a photo of a superhero moose t-shirt that I found funny. I have become a fan of naming my beers off the wall phrases, an idea stolen from Tired Hands, although I think alot of theirs come from literature. Some other beer names I've used are "It gets dark early out there"-Yogi Berra and "When they're bored they shoot alligators"-My sister. Haha, I like it. I've always been a fan of zany beer names, especially for homebrew. Tired Hands beer names would be absurd on a beer bottle or can, but for the way they run their brewery, it works and I love them. (Like you said, a lot of literature references, including Kurt Vonnegut references, which I can always get behind). I think I'm hooked on the decoction method as well. And next time I won't boil at all. Why the decision to not use hops? Do you do any aeration? Hey Jeff, I had used hops (Mash hopped) in my previous attempts at the style and kind of always questioned what I was getting out of them. After talking to a few local brewers who make some nice Berliners I decided to give the un-hopped version a try. Next batch, coming up soon will be identical but I will add hops to the decoction which I guess is the traditional method. I did not aerate prior to adding the Lacto, I racked from mash right to the fermenter with minimal splashing. I did give the carboy a shake for 30 seconds when I pitched the ale yeast, I wanted to give Conan a little bit of o2 but didnt want to blast it with my o2 stone.